Catherine, of The Dabels Divulge, shared what went on at her house one morning. And then this note comes flying in under the door. So of course I checked yes and unlocked the door. The things you have to do for a Pepsi these days. Leanne Shirtliffe (a.k.a. Ironic Mom) is the author of THE CHANGE YOUR NAME STORE (2014) and NO MORE BEIGE FOOD (2016). She also wrote humor books DON'T LICK THE MINIVAN: Things I Never Thought I'd Say To My Kids and MOMMYFESTO. She and her family live in Calgary, Alberta because they like complaining about the weather. Posted on October 28, 2013, in For Moms, Notes, Writing in Weird Places. Bookmark the permalink. 12 Comments. haha.. that is so cute!!!! Kids say the funniest things, so cute isn’t it? Hee, that is so cute???? 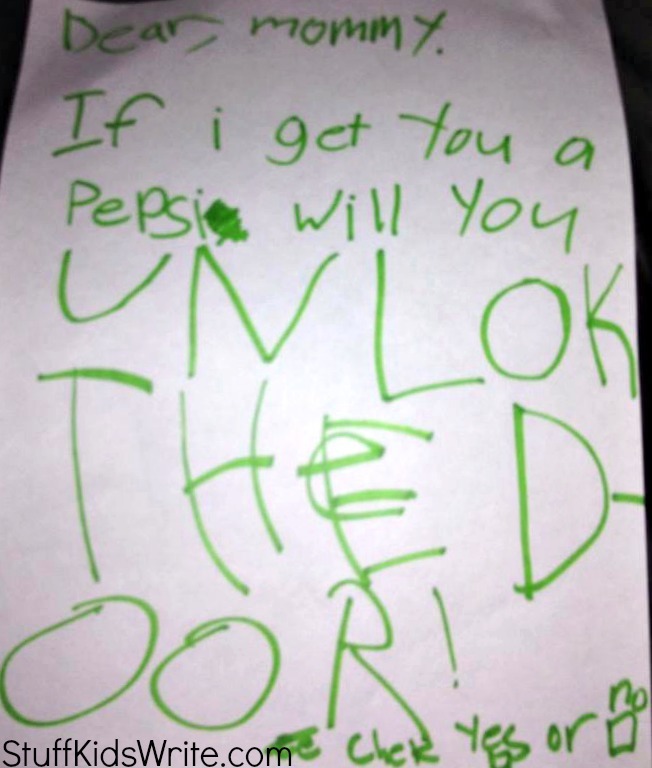 I see you love Pepsi lol She pulled the I am gonna get what I want card, how they learn quickly.